I'm Colin Morris, aka Professor von Explaino. This site contains little web-widgets I've built over the years along with documenting some of my explorations of the steampunk genre. For the code-savvy: I server-side code in PHP and web front end prefer Foundation. I'm very keen on the Behat implementation of Gherkin for user-testing and am happy to chat about my efforts. I have very little on github, I need to fix that. I'm also participating as much as I can in the IndieWeb, an excellent initiative for owning your own content. 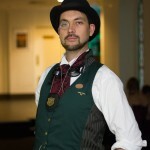 For the steampunk afficionado: I'm of the steampulp persuasion, a member of R.O.S.E.A, S.T.E.A.M and the Steampunk Ghostbusters and a middling tinkerer. I've had a book in mind for some time. People call themselves Code Ninjas and CSS Samurai. They're great sounding titles, but what does that mean? How is that distinct from Programmer Police or the Validation Army? Ninja have disciplines and the Samurai have their code of bushido. In my mind that's something that's missing from our own groups - discipline and a code. I'm a ninja fan, and a coding fan, so by mashing them together I made the Code of the Coder. 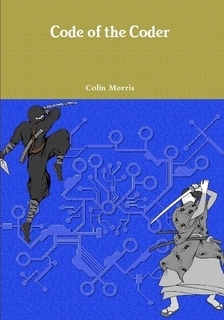 A short book that looks at the seven virtues of Bushido for the samurai and the eighteen disciplines of Togekure Ryu ninjutsu and transforms them via a tongue-in-cheek method into virtues and disciplines for coders. As the quote goes - if it's stupid but it works, it's not stupid. The book is available from Lulu in eBook or physical formats. If you read it, let me know what you think!